Is there a better alternative to Langenscheidt Professional-Dictionary Spanish? Is Langenscheidt Professional-Dictionary Spanish really the best app in Language category? 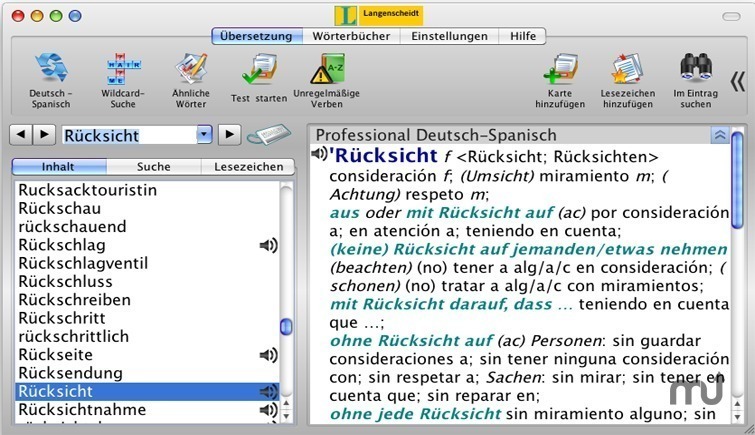 Will Langenscheidt Professional-Dictionary Spanish work good on macOS 10.13.4? The Langenscheidt Publishing Group is best known for its area of core competence: dictionaries and language learning material in various formats and on diverse media. Langenscheidt sets the highest editorial and production standards for all the products it publishes. The corporate logo, a blue "L" on a yellow background, is instantly recognized by many people all over the world. Version 7.7: Release notes were unavailable when this listing was updated. Langenscheidt Professional-Dictionary Spanish needs a review. Be the first to review this app and get the discussion started! Langenscheidt Professional-Dictionary Spanish needs a rating. Be the first to rate this app and get the discussion started! We are glad to present Langenscheidt Professional-Dictionary Spanish for Mac OS. Authoritative dictionary content and high-performance program shell Slovoed by Paragon Software (SHDD), the leading developer of multi-platform software applications for mobiles and computers, turn Langenscheidt into indispensable instrument for effective learning and translation. Around 151,000 entries (675,000 headwords, expressions and translations). Translates from and into German (German<->Spanish). Up-to-date vocabulary from all general language style levels. Extensive specialist terminology from all major fields. Additional information: examples of use, indicators showing distinctions between various meanings, grammar explanations. A comprehensive reference work for professional translations at the workplace, for teachers and students. NEW! Enhanced pop-up translation. Translate unknown words while reading e-mails, web-pages, e-book etc by hovering a mouse over a word. You do not need to waste time switching between several applications with Slovoed dictionary pop-up translation ��" it is now supported by Safari, Opera, Mozilla Firefox, and Google Chrome. IntraArticle Search. Thanks to a new feature of the application, you can search for words right in the dictionary article. Enlarge your electronic dictionary word database by creating your own dictionaries. Similar Words function helps you to find a word even if you do not remember its spelling. Find the list of irregular verbs for English and German dictionaries. This version of the dictionary is specifically designed to facilitate your most comfortable and efficient work with the dictionary, including hotkeys for often used operations.